My brother-in-law and sister driving down the streets of Burlington. As Tales From the Mutiny toured around New England, we were fortunate to have my sister, Marylou, and her husband, Craig, caravanning with us is their truck camper. My sister is an amazing activities director, and after 12 months on the road I was not opposed to turning over all of the decision making and planning to her. Since they love Vermont we were eager to have them show us around and a trip to Burlington was born. 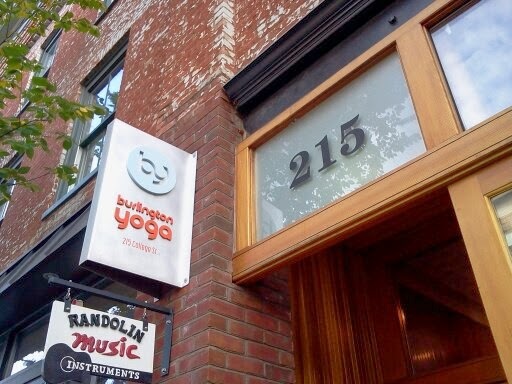 Burlington is abustle with everything yoga. I’m pretty sure everyone in the area is either a certified instructor or in teacher training…or a model for yoga clothes. The proper attire for Burlington seems to be yoga pants (or shorts) and Uggs and, for the most part, didn’t reflect the idea of conscientious consumer that I had been led to believe Vermonters embraced (damn you Bo and Eat More Kale, you set the bar so high). Lululemon is thriving in Burlington (at least it was back in October when I was there) and I imagine it will continue to thrive since Burlington appears to be a city of “name brand consumerism”. Fortunately, we came across a locally owned yoga clothing store that carries new upstart brands like Onzie, MPG and Beyond Yoga and supports some local artists too. 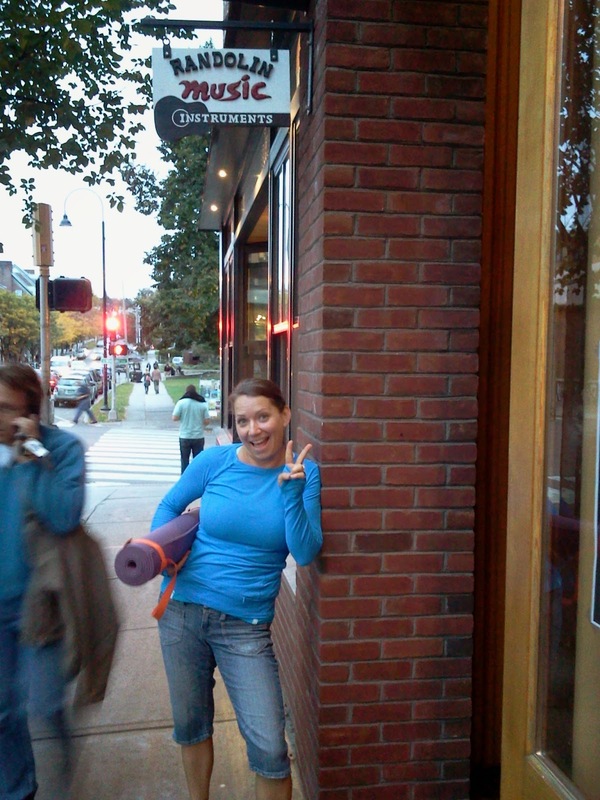 Stopping for #yogaeverydamnday outside of Yogarama Clothing Store. There were so many studios and options for classes in Burlington and we were only there a few nights so we simply picked, at random, a class that fit our schedule. 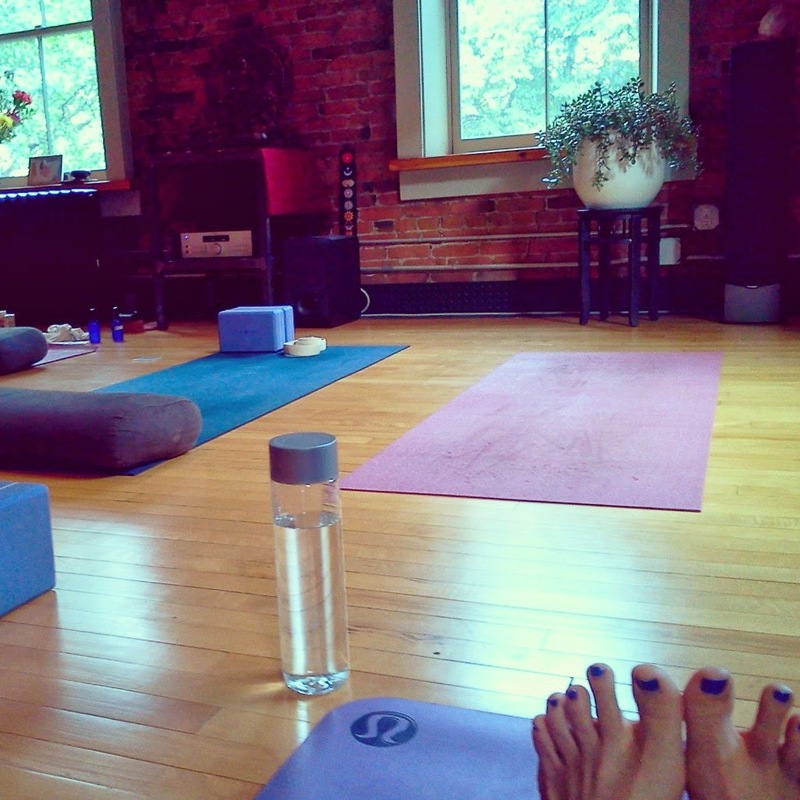 We ended up at Burlington Yoga for a late afternoon, 90-minute Flow class. I was happy to find that the studio was upstairs in an older building (as opposed to a shiny new boutique studio). We went up the narrow, creaky stairs and found a bench/coat room type area meant for taking off our shoes and jackets. I was somewhat surprised to read a sign encouraging us to bring our shoes into the yoga room due to some recent thievery of shoes. Shoes? Perhaps it was the vast amount of Ugg wearers that attracted shoes thieves to the area? After securing our shoes we made our way to an open space on the hardwood floor. The room had a nice energy…very organic and no where near as pretentious as I had imagined. However, there were a few things amiss. First…although a very nice man greeted us, had us sign our waivers and then collected our class fee he never really introduced us to the instructor. She never introduced herself either. 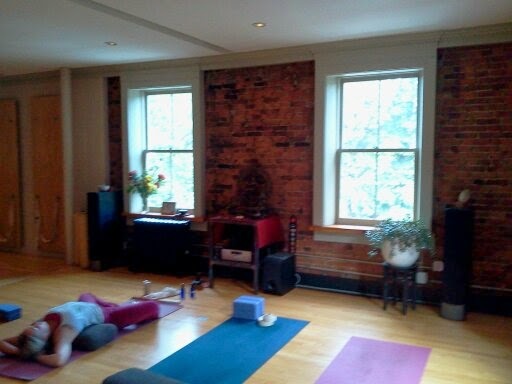 Upon entering there were 3 yoga mats (with bolsters and blocks) set up side by side at the right side of the room. I assumed they were other students so my sister and I rolled our mats out behind those. I did ask where the instructor would be located (just to be sure we were actually facing the right direction) and was informed (with the wave of a hand in the general direction of the 3 yoga mats) that she would be at the front of the room. As class began to fill and settle it appeared we had 3 instructors hence, the 3 mats at the front of the room…(or one instructor and 2 helpers?) as they seemed to be taking turns leaving their mat and making corrections. I’m not opposed to corrections, at all, I just like to know who these people are…and since there were no introductions I didn’t know exactly what was going on. Another issue I had was that these 3 people were in the room the entire time my sister and I were, including when we were asking where the instructor would be located. A perfect opportunity for someone to say “hey, I’m so-and-so, I’m your teacher today…why don’t you gals grab a bolster and block and we’ll get started soon.”. Nope, instead, she was a stranger to us AND we had to get up in the early part of class to grab a bolster (as did a few other students) since no one made it clear they were necessary. Now for the good stuff. Although I was unsure who was touching me and making corrections (some of which I had never been told and wasn’t sure if they were ‘correct’) I really appreciated that they were hands-on. There’s nothing like taking a class, paying $15 and never having the teacher acknowledge your practice. Even if I don’t need any corrections (ha) I’d at least like to know I’m doing it right(ish). I mean, I can (and do) my own yoga practice at home, for free, without assistance or corrections. So why pay $10-20 for someone to stand up front and never offer personal attention? Our teacher had new and interesting approaches to moving into poses that I was unfamiliar with at the time. When most of your practice comes from traditional flow classes it sometimes get redundant…constantly moving into poses from down dog and high lunge. This class had my attention. This class was as far removed from the glossy pages of Yoga Journal and Lululemon as it could be for the area. I allowed myself to get “worried” that I wouldn’t fit in with the class. I’m the girl that still wears the same black yoga shorts I got on clearance (for $5!!) 7 years ago at Old Navy (hey, it was before I really embraced the conscientious consumer idea) and an old cotton tank top. These are the same clothes I wore for boxing, cross fit, running, spin class, and my marathon. Well, I was in good company. Torn and faded sweat pants, old concert tee-shirts, make-up free faces and messy hair surrounded me. It felt like home. It also felt organic…not like these people purposely found some old clothes to wear to class to make a statement. It was real…and welcome. The teacher seemed a little more welcoming after class…perhaps she’s just shy or introverted? But I would encourage her to mingle a bit with the students before class…or at the very least, introduce herself to students she’s never seen before. One disappointment was that the next class was scheduled so close in time to our’s ending that we had people hovering over us to claim a spot. Several appeared irritated that it tools us a couple of minutes to gather our things and vacate the floor. After a class I like to take my time, after all, we had barely been out of savasana for 2 minutes! 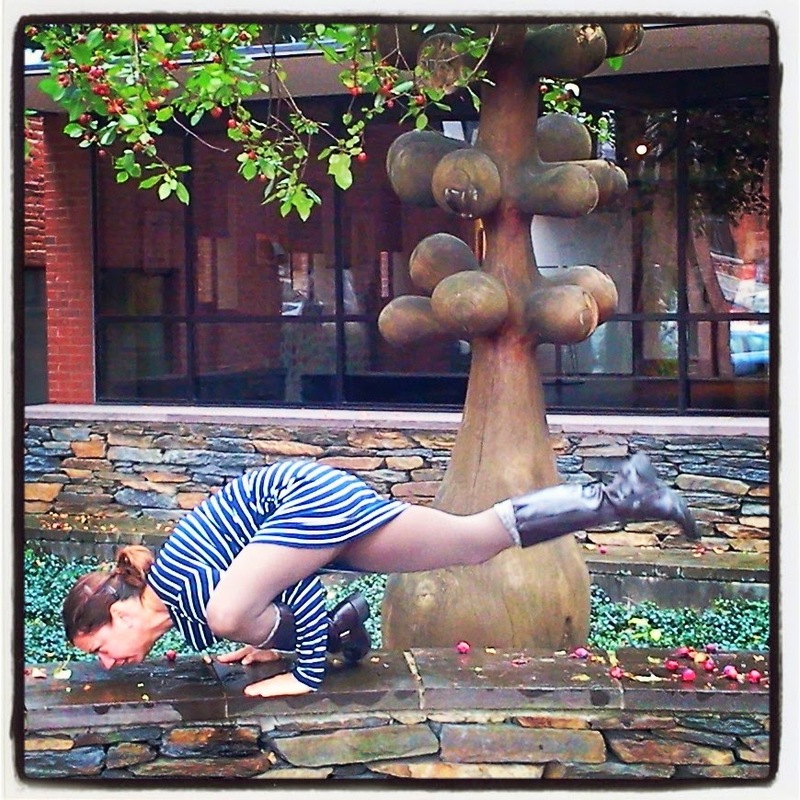 If I find myself in Burlington again I’d love to take a class at Laughing River Yoga. 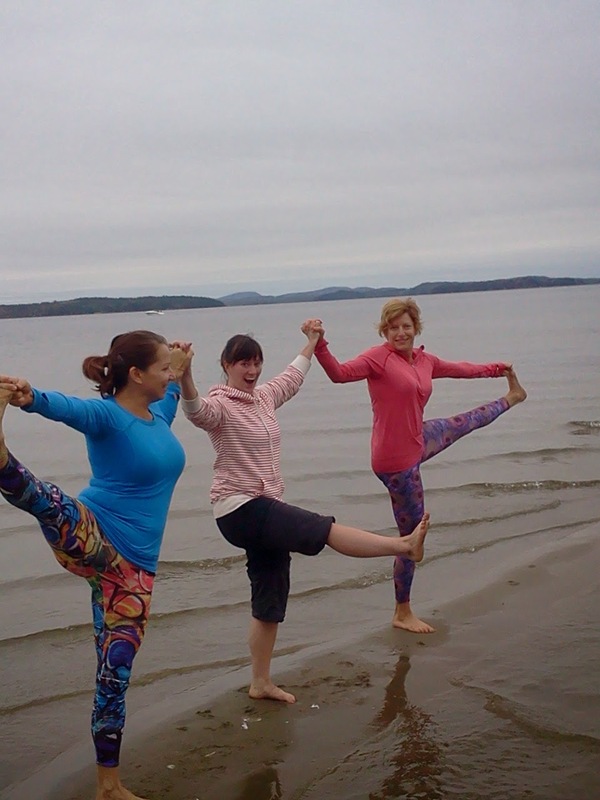 Me, our friend Lindsey and my sister, Marylou during an early morning lakeside practice.